2x ACC Coach of the YearThe mastermind of the triple option offense at Georgia Southern, Navy, and currently Georgia Tech, Coach Paul Johnson explains the Triple Option, the Triple Option Load, and the play action passing game off of the triple option look. While at Georgia Tech, he has been one of the leaders in the nation in rushing year in and out, while producing such NFL wide receivers as Calvin Johnson and Demarius Thomas. 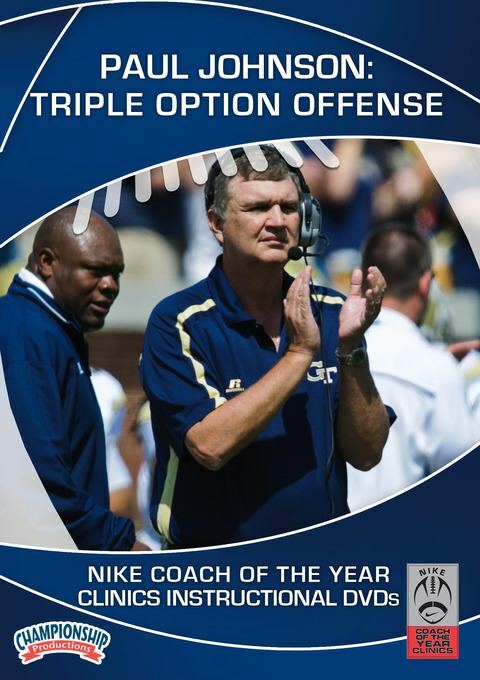 In this DVD, Coach Johnson gives an in depth analysis of the triple option. He discusses rules of every position, and how to attack defenses. He thoroughly addresses the 4-3 both over and under, 3-4, and 3-3 stack amongst others. Coach gives great insight on attacking the different defenses, figuring out what they are trying ot do to stop the triple option, and counter moves to attack and be successful. Coach Johnson coaches you up using game footage of the powerful option offense. He diagrams and discusses the blocking rules versus all defenses and discusses defensive tactics used to stop his offense and what adjustments he uses to defeat any defensive set. Johnson discusses the alignment of the “A & B” backs as well as motion and attack rules. The quarterback in the option is trained to read 1 and pitch the ball off of number 2. The B back will align his heels at 5 yards and explode to the line of scrimmage reading the first down lineman inside the quarterbacks’ key. You’ll also see “the load,” which is an adjustment off the basic triple option, with its advantages and when and how to use it for optimum success in the game. The next segment of the video is a talk about the play action passing game that is based on the triple option. Coach Johnson explains how he simplifies the play-action pass for the offensive line and sells the triple option run game, which includes his rules and disguises to mesh your run game and play action passing game. He emphasizes the fact that his offense will hit a big pass play at some point in the game based on the emphasis teams must place on stopping their running attack. As a bonus, Johnson answers questions and points out key concepts in running the flexbone at the high school level. Whether you are currently running the triple option and want to learn more or have to defend it and want to understand how the offense works, this video is a must. Even if you are not an option team, you could incorporate the triple option into your offense through Coach Johnson’s in depth analysis and attention to detail. Produced at the 2013 Denver (CO) Nike Coach of the Year Clinic.